Pictures from the Saturday, October 29, 2016, IHSA Marist Sectional can be found on the Pictures/Video page. 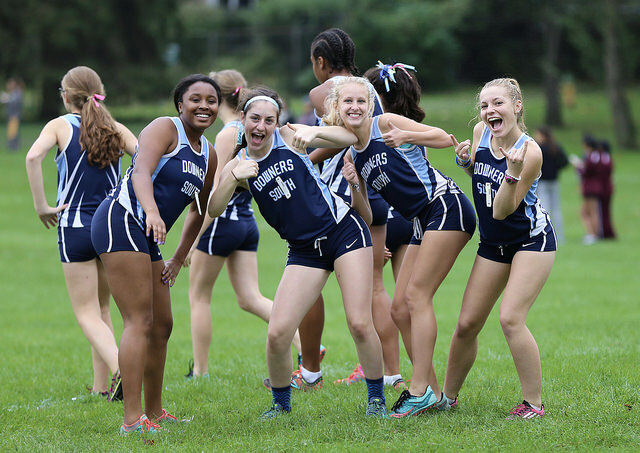 Thanks to Laura Duffy for providing amazing pictures from nearly every meet this season! Author Coach PlunkettPosted on October 30, 2016 Categories Cross CountryLeave a comment on IHSA Marist Sectional Pictures! The DGS girls cross country team placed 1st out of 19 teams at the IHSA Marist Sectional meet on Saturday. The Mustangs scored 69 pts to easily outdistance runner-up Lyons Township (101 pts), Lockport (101 pts), Hinsdale Central (114 pts), and Plainfield North (136 pts). All of the top 5 teams punched their ticket to next week’s IHSA State Championship meet. Brenna Cohoon (Fr) led the Mustangs for the 2nd week in a row, finishing in 5th place overall. Erin Reidy (Fr) joined Cohoon in earning All-Sectional honors with her 10th place finish. Melissa Weidner (So) was close behind in 12th place and Becky Versaskas (So) finished in 18th place. Katie Stapleton (Sr) rounded out the scoring with her 24th place finish. Kennedy Warden (Fr) and Olivia Duax (So) were finished in 30th and 48th places respectively. When the race started, all seven DGS runners got out strong were spread out over the first 15-20 positions. Erin Reidy and Katie Stapleton were in the top 5-6 places, while Brenna Cohoon, Melissa Weidner, and Becky Versaskas were placed around 10-12. As they approached the first mile, only 6 seconds separated the Mustang 1-5 pack with Reidy leading the way. Much of the 2nd mile of the Midlothian Meadows course is routed through a woodland path and when the runners emerged, positions had changed somewhat. Cohoon had moved up into the top 7, followed closely by Reidy and Weidner. About 10-12 seconds back was Versaskas, followed by Stapleton another 7-8 seconds back. Both Kennedy Warden and Olivia Duax had positioned themselves ahead of several top 5 runners from Lyons Township, Lockport, and Hinsdale Central. This pushed their team scores even higher. The Mustang packed picked up a couple of positions over the final mile of the course, leading to the final placings and the team victory. DGS individual results/splits can be found on the Schedule/Results page. Full meet results can be found here. As has been the case all season long, this was a great team win! Our girls have worked together and helped each other through some tough races. I’m very proud of the fact that when one teammate has struggled, another teammate has always stepped up and gotten the job done. Today was no exception as all seven varsity runners played an important role in this win. The sectional championship is the 3rd one earned by DGS over the past 6 seasons. It also marked the 6th straight trip to State for the entire team. DGS will compete next Saturday at Detweiller Park in Peoria against 24 other teams for the state championship. Our race will be at 1:00 pm. Please consider making the trip to Peoria next weekend to cheer on our Mustangs! Author Coach PlunkettPosted on October 29, 2016 Categories Cross CountryLeave a comment on Mustangs win Sectional! IHSA Sectional meet on Saturday! 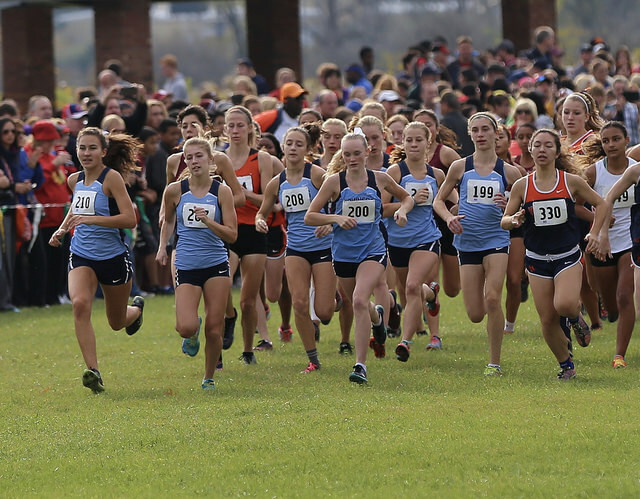 On Saturday, October 29, the DGS girls cross country team will travel to Midlothian Meadows forest preserve in Midlothian, IL for the IHSA Marist Sectional meet. This meet will determine which teams qualify for the IHSA State Championship meet. There will be 19 teams competing, and the top 5 teams will advance to the State meet. The Mustangs are the top ranked girls team entered in Saturday’s race, but competition will be fierce among the first 4-5 teams. According to the DyeStatIL final regular season rankings, DGS is ranked #6 in the state. They are followed closely by #7 Lyons Township, #8 Hinsdale Central, #12 Lockport, and #25 Plainfield North. Unranked teams Marist, Oak Park-River Forest, and Plainfield South will also be in contention for state qualification. The girls should arrive at DGS by 7:15 am. The bus is scheduled to leave at 7:30 am. Our race will go off at 10:00 am, followed by the boys race at 11:00 am. The awards ceremony will take place at approximately 12:00 pm. 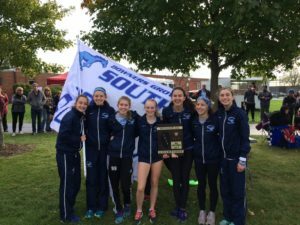 Author Coach PlunkettPosted on October 27, 2016 Categories Cross CountryLeave a comment on IHSA Sectional meet on Saturday! On Saturday, the DGS girls cross country team traveled to Lockport to compete in the 1st round of the IHSA state series. The Mustangs placed 1st out of 10 teams by scoring 43 pts, just ahead of the host Lockport team (48 pts) to win the regional title. Brenna Cohoon (Fr) was the top DGS finisher, placing 5th overall and earning All-Regional honors. She was followed closely by Melissa Weidner (So) in 7th place, Katie Stapleton (Sr) in 9th place, Erin Reidy (Fr) in 10th place, and Becky Versaskas (So) in 12th place. Olivia Duax (So) and Allison Calek (So) placed 29th and 35th respectively. The hilly Dellwood Park course proved to be as much of an opponent as the rest of the field as the Mustangs battled through the race. Early on, it was obvious that it was a 3-team race between DGS, Lockport, and Plainfield North. Lockport made the first move and took control of the race at the beginning, as their top 3 runners were all placed in the top 5. Katie was the lone Mustang in the lead pack along with 2 Plainfield North runners. The main pack of DGS runners followed behind in roughly 10th through 15th places as they approached the 3/4 mile mark. Positions remained basically the same throughout the first 1.5 miles. At that point Katie started to fall back some, while Brenna and Melissa caught up to her. Over the next mile, all of the DGS runners rearranged into their final finishing order. Lockport still had 3 girls ahead of our first, but we had closed the gap on them. Our pack of 5 was ahead of their 4th and 5th runners, but they still held a slight lead in the race at that point. Plainfield North still had 2 girls in the top 3, but their next 3 girls were too far back to make a difference in the team scoring. Over the final 1/2 mile, the DGS pack continued to inch forward. Both Brenna and Melissa each passed Lockport runners in the final 200m to help transition a very close race into a 5 point victory. As has been the case all season long, this team has stepped up to help each other out. When some girls struggle, others have helped carry the load. This regional championship was truly a team effort! The most important result of the day was qualifying on to next week’s IHSA Sectional meet. The girls will compete at the Marist sectional at Midlothian Meadows forest preserve on Saturday, October 29th at 10:00 am. The top 5 teams out of the 19 competing will qualify for the State Meet. Full meet results can be found on Athletic.net and pictures from the meet can be found on our Pictures/Video page. Author Coach PlunkettPosted on October 23, 2016 Categories Cross CountryLeave a comment on Regional Champs! IHSA Regional Meet Up Next! The DGS girls cross country team will compete in the IHSA Lockport Regional meet at 10:00 am on Saturday. This meet is the first step in the 3-week state series competition. The Mustangs will be one of 10 teams racing at Dellwood Park in Lockport, vying to qualify on to the next week. The top 6 teams out of the 10 competing teams will advance to next week’s sectional meet. Three teams (DGS, Lockport, & Plainfield North) are ranked among the top 25 teams in Illinois according to DyeStatIL and should lead the qualifying group. The Dellwood Park course is a hilly 3.1 mile layout that will challenge all of the runners, regardless of rankings. While winning the team race is always a goal, the main objective will be to advance the team to the sectional meet and staying healthy. Author Coach PlunkettPosted on October 20, 2016 October 20, 2016 Categories Cross CountryLeave a comment on IHSA Regional Meet Up Next! Pictures from the WSC Gold Conference Championship meet are posted on the Pictures/Video page. Author Coach PlunkettPosted on October 17, 2016 Categories Cross CountryLeave a comment on Conference Pictures! 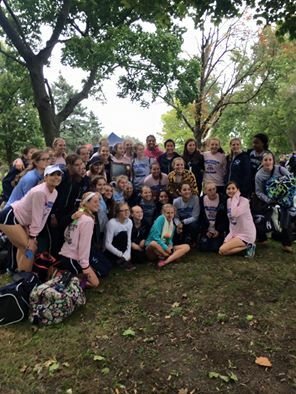 On Saturday, the DGS girls cross country team traveled to Katherine Legge Memorial Park in Hinsdale to compete in the WSC Gold Championship meet. The Mustangs left victorious with a dominating performance on every level. DGS won the sophomore, JV, and varsity team competitions with ease while also capturing the individual championship in every race. This year marked the 18th year in row that the varsity team left the meet as conference champions, a streak that began in 1999. It was also the 31st championship in 36 years. The first race of the day was the freshman race. The Mustangs only entered 3 girls in this race, which unfortunately eliminated the possibility of posting a team score. We have a pretty small freshman class this season with only 7 girls and 4 of them were running up at the sophomore and varsity levels. The remaining freshman did a great job in this first race with Marlo Rachie (Fr) making a strong move during the 2nd mile to take the lead and eventually finish in 1st place in 22:12. Gillian Musial (Fr) had her best race of the season (24:02), finishing in 8th place out of 50 freshman runners. Zoe Kurzweil (Fr) also had a strong race (27:20), placing 31st overall. The next race was the sophomore race where we entered 6 girls. Allison Calek (So) took the lead right from the gun and held it for the entire race to finish as the sophomore individual champion in 19:57! She was followed by 2 more Mustangs as DGS completed the 1-2-3 sweep. Julie LaLonde (So) ran a season best time (20:20) to place 2nd overall. Erin Glennon (Fr) handled the move up to the sophomore level with ease as she placed 3rd out of 60 sophomore runners with 21:06. Amanda Annese (So) finished in 5th place not far behind Erin with a season best time of 21:22. The 5th scoring runner for DGS was Clare Quirin (So) who just slipped in under 22 minutes, finishing 11th with a time of 21:59. First year runner, Amina Hosic (So) had a nice race as well, finishing in 40th place with 26:20. The sophomore team scored 21 pts easily win the team title over 2nd place Morton (47 pts). The varsity team entered the race as heavy favorites to win the team title and didn’t disappoint. The 7 Mustang varsity runners finished in the first 7 places for the first time in conference history and scored a perfect 15 pts for 1st place. Katie Stapleton (Sr) repeated as the individual conference champion as she cruised to finish line in 18:13. The next 3 girls were packed up within 8 seconds of each other with Brenna Cohoon (Fr) taking 2nd place in 18:29. She was followed closely by Becky Versaskas (So) who ran 18:31 to place 3rd. Melissa Weidner (So) completed the trifecta with her 4th place finish in 18:37. Erin Reidy (Fr) was uncharacteristically 40 seconds further back, but still managed 5th place in 19:17. Olivia Duax (So) continued her strong sophomore season with a 6th place finish in 19:24. The final finisher for the Mustangs was 7th place Kennedy Warden (Fr) with a time of 19:40. This group will continue to compete over the next 3 weeks as DGS enters the IHSA state series. The final race of the day was the JV race. It was also the largest with 18 Mustangs entered in the field of 99 runners. Before the race started, I challenged the team to improve upon the varsity sweep of the first 7 places. They were definitely up to the task, putting the first 9 finishers into the chute (and 12 out of the first 13 finishers)! Gillian Thomas (Jr) stormed into the lead immediately and continued to stretch that lead for the whole race, eventually winning by more than 30 seconds with a time of 19:48. Kara Petersen (Sr) was the runner-up, placing 2nd in 20:22. She was followed by a trio of Mustangs including Riya Bhasin (Jr) who was 3rd in 20:39, Hailey Rodden (Jr) who was 4th in 20:44, and Carli Smid (Jr) who finished 5th in 20:48. Megan Albers (Sr) was the next DGS runner in the chute with her 6th place finish in 21:01. Natalie Olsen (Jr) completed her comeback from injury, finishing her only race of the season in 7th place with a very competitive 21:36 time. Annie Engel (Sr) saved her best race for last as she ran 21:37 for 8th place. Sarah Ansah (Jr) was close behind to place 9th overall in 21:41. Mary Eterno (Sr) ran a gutsy race in only her 2nd race of the season to finish 11th in 22:05. Amber McCauley (Jr) was only one step behind in 22:06 for her 12th place finish. Johanna Skibbe (Jr) completed the group of Mustang front runners with her 13th place finish in 22:11. The JV team also scored a perfect 15 pts to take the team championship and finish off the day with an exclamation point! I also want to mention a group of athletes that did not get the opportunity to compete on Saturday (Emily Kaszyk-Sr, Victoria Protsyuk-Sr, Gabby Senne-Jr, Katie Meyr-Jr, Teagan Halik-Jr). These girls not only missed out on running in the conference meet, but several other meets this season due to injuries. Not being able to run when all of your friends and teammates are heading excitedly to the starting line can be extremely frustrating. But I give these girls all the credit in the world as they still showed up every day, attempted to cross-train when appropriate, helped with whatever needed to be done at practices and meets, and most importantly still made a positive impact on the team. We would not have been as successful as we have been without these outstanding young ladies! I am extremely proud of the entire team for what they have accomplished not only on Saturday, but all season long. This is an amazing group of girls that have loved and supported each other throughout the entire time we’ve been together. They truly embody the meaning of the word teammates! Full DGS individual results & splits can be found on the Schedule/Results page. Complete meet results can be found on the Athletic.net page. Author Coach PlunkettPosted on October 16, 2016 October 16, 2016 Categories Cross CountryLeave a comment on WSC Gold Conference Champions! On Saturday, Oct 15, the DGS girls cross country team will travel to Katherine Legge Memorial Park in Hinsdale to compete in the WSC Gold Division Championship meet. The Mustangs will run against conference foes Addison Trail, Hinsdale South, Leyden, Morton, Proviso East, and Willowbrook. Prior to this season, DGS has won 17 consecutive conference titles. This will be the last meet of the season for our F/S and JV runners (unless they are competing in the NXR meet on Nov.13). The varsity will continue with the 3-week IHSA state series (Regional, Sectional, & State) ending with the State Championship meet on Nov. 5th. Author Coach PlunkettPosted on October 11, 2016 Categories Cross CountryLeave a comment on Conference Week! On Saturday, Oct 8, the DGS girls cross country team traveled to the Stuart Sports Complex for the West Aurora ‘Stampede’ Invite. It was a beautiful day to run on one of our favorite courses, and it showed as 14 of our 29 runners ran season best times. Team scores may have been a little skewed as 3 DGS varsity runners did not compete. Despite being short-handed, the varsity team still placed 3rd out of 18 teams competing. The F/S team placed 9th out of 13 teams, and the JV team placed 4th out of 9 teams. In the varsity race, Erin Reidy (Fr) led the Mustangs with her 6th place finish. Melissa Weidner (So) and Brenna Cohoon (Fr) were next into the chute for DGS, placing 11th and 14th respectively. Olivia Duax (So) placed 30th and Allison Calek (So) completed the scoring with her 67th place finish. Gillian Thomas (Jr) and Kara Petersen (Sr) were the DGS #6 and #7 varsity runners. Julie LaLonde (So) set the pace for DGS in the F/S race by placing 11th overall. Erin Glennon (Fr) was the next Mustang finisher in 27th place. Amanda Annese (So) and Clare Quirin (So) were close behind in 41st and 47th places. Marlo Rachie (Fr) was the final scoring runner to cross the finish line in 77th place. Zoe Kurzweil (Fr) and Amina Hosic (So) were the DGS #6 and #7 F/S runners. In the final race of the day, Riya Bhasin (Jr) was the top DGS JV finisher in 15th place. She was followed by Carli Smid (Jr) and Megan Albers (Sr) in 21st and 22nd places. Hailey Rodden (Jr) was close behind in 26th place. Both Sara Ansah (Jr) and Johanna Skibbe (Jr) had great races to finish in 31st and 33rd places. In her first race of the year, Mary Eterno (Sr) surprised with a 40th place finish. Complete DGS individual times/splits can be found on the Schedule/Results page. Full meet results can be found on the Athletic.net page. The Pictures and Video page contains pictures taken at the meet. The Mustangs will compete this Saturday at KLM Park in the West Suburban Conference Gold Division championship meet. This will be the final meet of the season for F/S and JV runners. The varsity will then continue into the IHSA state series. Author Coach PlunkettPosted on October 11, 2016 October 11, 2016 Categories Cross CountryLeave a comment on West Aurora Invite Results!